We are back with the review of this month's My Envy Box. If you follow us on +YouTube India , you would have already seen our unboxing and review. In case, if you are still not following +Ekta Khetan on #YouTube, Subscribe today! What's Inside My Envy Box? I have unboxed the MEB on my YouTube Channel, You can watch the video embedded below or click here! The collective MRP of all products inside the box is around Rs 2000 plus. The MRP of the box is Rs 850. If you opt for a 3monthly or an annual subscription plan, the cost per box will be even lesser. You can also use a special discount code "KISSNTELL" to avail a discount of 20% on your order. Haute Kutir Verdict: The box has followed the theme and contains all the products related to eyes and lips. I am really looking forward trying the "eye Tailam" and the soul tree lipstick that promises goodness of natural ingredients. Rest all other products are ok- ok. The box has 2 lip balms and it did not feel so good to me. Overall, the box is a good buy and could have been better, considering it is the holiday month and expectations are naturally high. The box cover comes printed in a quirky "lashes and pout" design. Overall, since it is festive season, this would make an excellent gift option. I will be as usual booking some boxes for my friends. How about you? 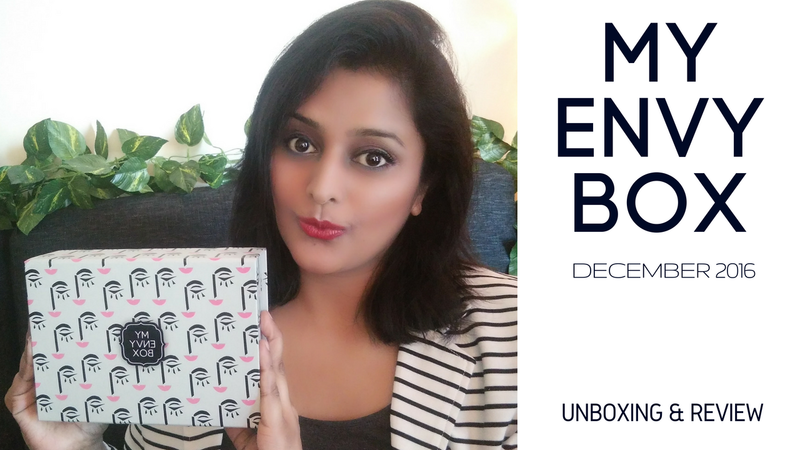 Check out My Envy Box website for more discount and subscribe to their newsletter for periodic discount and offers. If am not mistaken, they were giving a piece of jewellery in the new subscriptions. If you want me to review any of the products that came inside my box, do let me know.